Marty McDice is a submarine captain and a very adventurous guy! He loves diving into the bottom of the Pacific Ocean and exploring the marine life there. But to go deeper, he needs your help. Simply roll the dice and pick which ones you would like to keep in order to increase your score. But be careful and choose wisely, because the odds may work against you! 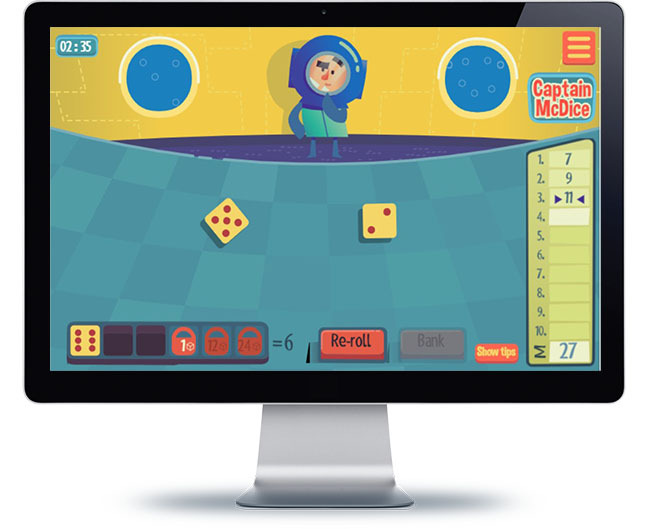 In this dice game, your goal is to roll the dice and get the highest score possible! The game starts with 3 dice, but you can unlock more as you play. You have 10 turns in total; the challenge is that you need to score higher than the last turn, but low enough to ensure you get a better score in the following turn. If you don’t get a better score in the next turn, you don’t receive any points.